Help Make This Season Shine Bright! The Bemidji Jaycees are proud to continue this treasured Christmas tradition. The Jaycees continue to expand the light display throughout the downtown and beyond. This is an extremely expensive undertaking and we cannot do it without your support. Please consider making a donation or becoming a sponsor! DO YOU WANT YOUR SPONSORSHIP TO STAND OUT IN THE CROWD? Consider becoming one of the 5 Golden Wreath Sponsors (SOLD OUT for 2018)! These five wreaths are 6 feet tall and are illuminated with clear lights. For a sponsorship of $500.00 per wreath, your business, family, or organization will have your name featured in the center of a wreath. These wreaths will be placed down at Paul Bunyan Park and will be illuminated throughout the holiday season. We also have a new sponsorship opportunity for 2018! "Babe's Trees" will be in the 4 planters (SOLD OUT for 2018) that are located in the plaza in front of the Paul & Babe statues. Your logo would be wrapped around all four sides of this 3'x3' planter and a fresh cut Christmas Tree will be placed in the center. This is a high traffic area, with great visibility, that will give your business exposure as a proud sponsor of First City of Lights! The cost is the same as a Golden Wreath Sponsorship. Please use the First City of Lights Donation Contact Form below if you would like to speak to Josh, "Captain Christmas", about this great opportunity. Receive a personalized letter addressed to your child from Santa himself, along with a surprise! FOLLOW THE LINK FOR AN ELECTRONIC MAP! HAPPY TOURING! BE SURE TO COME BACK TO OUR WEBSITE TO VOTE FOR YOUR FAVORITE STARTING NOVEMBER 23. The Bemidji Jaycees are once again compiling a list of homes and creating a map of the decorated homes. There is no charge to add your home to the list and spread the holiday cheer! We simply ask that you have your lights on from 5pm to 10pm, 7 days a week, from November 23, 2018 to January 1, 2019. To add your home to the FIRST CITY OF LIGHTS TOUR OF HOMES 2018, just follow the link below to register your home by November 16 to be on the tour. After registration closes, your address will be added to our tour map. We will then publish the map of the tour and have it available online. It will also be available for pick up at the Bemidji Jaycees Night We Light Festival, held on November 23, in Santa's Workshop (located inside the Bemidji Area Chamber of Commerce Tourist Information Center in Paul Bunyan Park, at the Lake Bemidji water front by Paul and Babe) as well as various locations around town. Stay tuned for more details. Stay updated on our special Facebook page here for the First City of Lights Tour of Homes! Click on the link below to get your home registered today! The Bemidji Jaycees are once again sponsoring the First City of Lights Christmas Window Decorating Contest. There is no entry fee to participate. We are encouraging the downtown businesses to decorate their windows with light displays for the holiday season. The public will vote from November 20 (at dusk) through December 8 at the Bemidji Chamber with write-in votes. To be eligible, please register your business through the link below. All windows must have a sign that states they are participating in the contest. All windows must also be lit from dusk to 10 p.m nightly from November 20 - December 25. If you have questions, you can contact the Bemidji Jaycees through the First City of Lights Contact Form below. Click on the link below to get your business registered today! Please visit these participating businesses to enjoy their window displays! Then go to the Tourist Information Center at 300 Paul Bunyan Dr NW to cast your vote! First City of Light Banners will be decorating Bemidji’s streets during the months of November, December and January. The Bemidji Jaycees are excited to continue the tradition of making Bemidji be known as The First City of Lights! Our yearly fundraising efforts are used to continue to build and grow this premiere holiday event! Beginning in mid-November, Bemidji’s downtown street lights will be decorated with Christmas City banners. As an incentive for businesses or individuals that wish to contribute to our Christmas light display, each banner will feature the business or donor’s name. The banners will spread holiday cheer throughout Downtown Bemidji, building excitement for the Night We Light Parade and will show our appreciation to those who contribute. We have a new sponsorship opportunity for 2018! "Babe's Trees" will be in the 4 planters that are located in the plaza in front of the Paul & Babe statues. Your logo would be wrapped around all four sides of this 3'x3' planter and a fresh cut Christmas Tree will be placed in the center. This is a high traffic area, with great visibility, that will give your business exposure as a proud sponsor of First City of Lights! The cost is the same as a Golden Wreath Sponsorship. Please use the First City of Lights Donation Contact Form below if you would like to speak to Josh, "Captain Christmas", about this great opportunity. The Bemidji Jaycees also organize the Night We Light Parade, in addition to the First City of Lights activities! We invite your business or organization to be a part of this annual tradition! 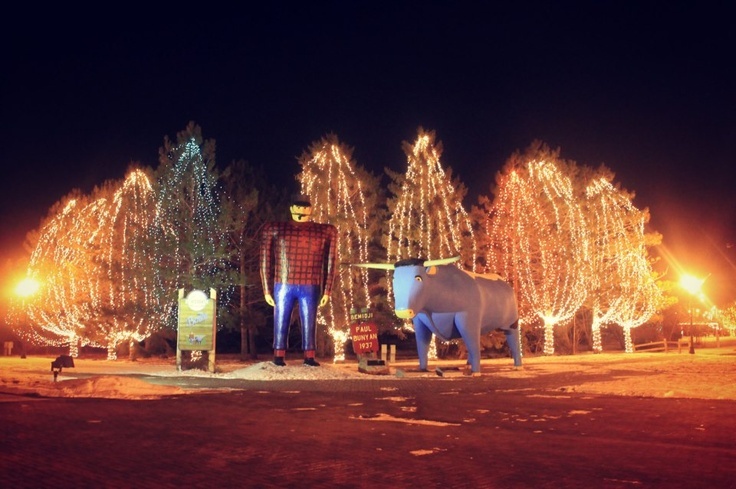 Please join us after the parade at the waterfront by Paul & Babe as we "flip the switch" to light the trees, signaling that the holiday season has begun in Bemidji. If you or your organization would like to participate in the parade, please fill out and send in the registration form. There is a $25.00 registration fee for businesses; there is $10.00 fee for non-profit organizations. Pre-registration is required by Friday, November 16, to be included in the parade. If you do not pre-register you will be placed at the end of the parade line-up and charged a registration fee of $35.00. Please see the form for additional parade guidelines. The parade route will be the same as in years past where we will stage the parade in the Beltrami County Administrative Building Parking Lot on the Irvine Avenue side. The parade will start at the parking lot entrance on the north side and going east on 8th Street --> south on Beltrami Avenue --> west on 3rd Street, where it will end at the intersection with Irvine Avenue. From there, units can make their way back to the staging parking lot if needed. See the Registration Form for full details and guidelines. There is NO PARKING allowed in the Beltrami County Administrative Building Parking Lot so please plan accordingly. All parking will be off-site on the surrounding streets so we recommend that you carpool or have someone drop you off. PLEASE DO NOT HAVE A LIVE SANTA CLAUS ON YOUR FLOAT! Please respect that there will be one float with a live Santa Claus as to not confuse children. We encourage you to register online through our secure registration link. Click on the "Parade Registration" button below to get started. If you have any problems, please fill out the contact form at the bottom of this page. If you wish to pay by check, please download the paper form and mail it in. PRE-REGISTRATION IS DUE BY NOVEMBER 16! Avoid the late fee and get registered today! ATTENTION: All parade participants must agree to the Release/Hold Harmless Agreement. Please pass the form on to your participants. Forms for all parade participants must be turned in at the registration/check-in or e-mailed to bemidjijaycees@gmail.com by November 21. ADDITIONAL QUESTIONS FOR THE PARADE OR THE FIRST CITY OF LIGHTS ACTIVITIES? Use the appropriate contact form below.